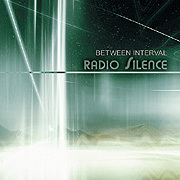 On Radio Silence (73'55"), Between Interval realizes music that inhabits two worlds - one of drones, texture and atmosphere, the other running along a digital plane of entrancing electronica. The contour of this album gently changes according to the energy of each track. Dynamic and focused pieces eventually fall away into interludes full of breathing pads, squelchy voices and the dreary sound of rain falling on sidewalk. In an unpredictable manner, shifting currents of dark sounds yield to mysterious beats, skipping rhythms and metallic melodies. This work moves up and down and side to side in a seeping flow of somber tones from moaning synthesizers. There is not much air in the 12 tracks, which leads to the overall mood of abandon. Radio Silence is a dream with its own soundtrack - a fantasy of a bleak time yet to come.